Get some of our best rangoli designs 2015. 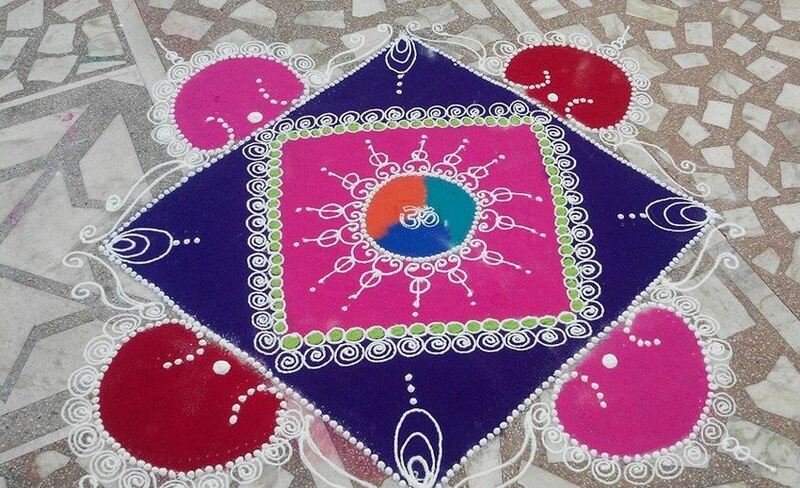 These rangoli designs can be made for competition, festivals and other special occasions. These rangoli designs 2015 is made up of rich warm colors and inspiring patterns. It has a lovely color combination. Make this rangoli design for competition and win prizes. 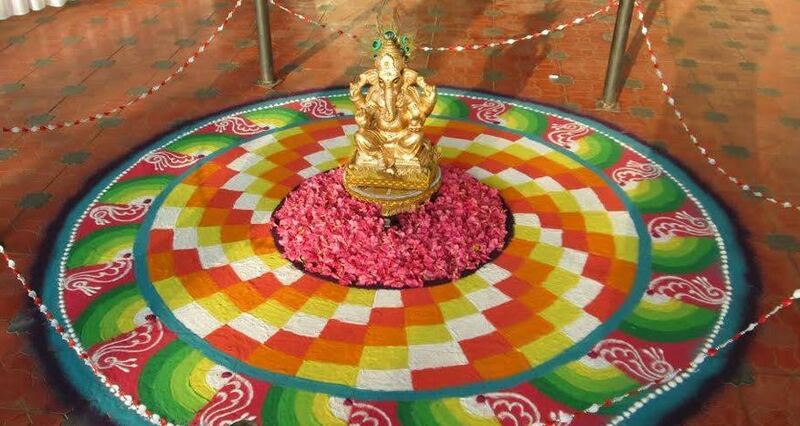 Place Ganpati idol in the centre and draw this beautiful rangoli around it. Use green, yellow, orange and white color. 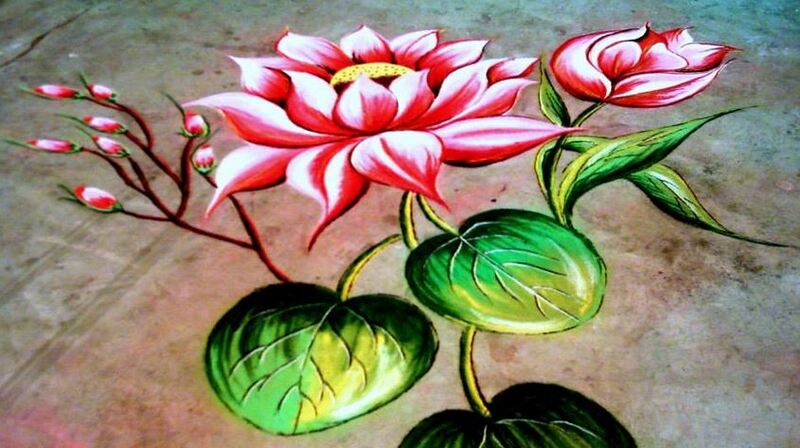 Here is a perfect rangoli design, it’s colorful and creative. Make this rangoli design in your living room and get lots of compliment from your guests. Use vibrant colors to create it. Add lots of color to keep your rangoli designs 2015 bright and beautiful. Create a vibrant centre to get all the focus. 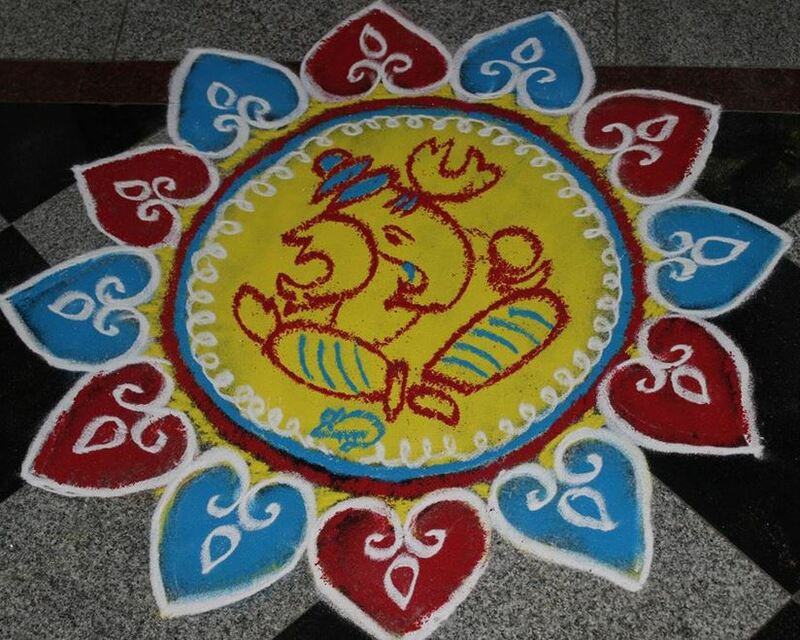 This is a simple rangoli design; you can draw these rangoli designs for Diwali and Ganesh puja too. 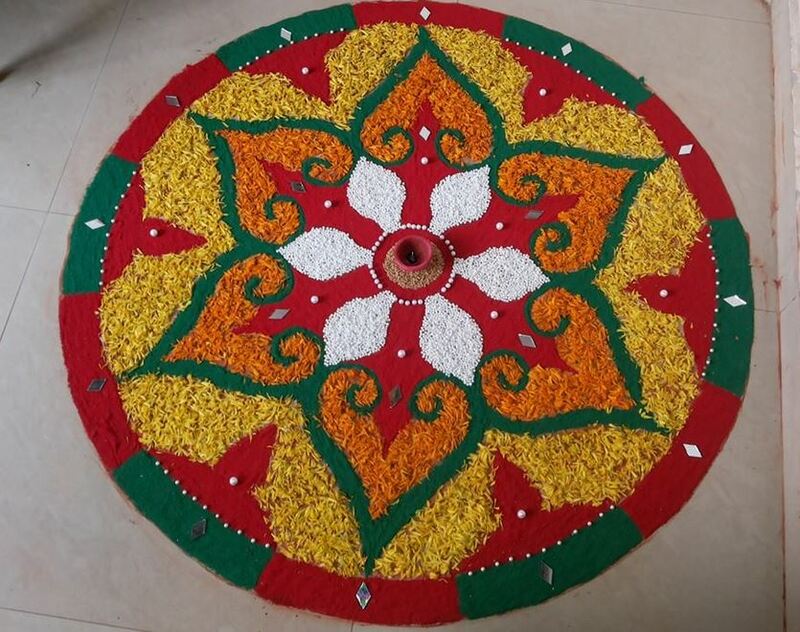 This rangoli design is made using yellow and orange marigold petals, beads and small mirrors. Use green and red colour to make this attractive rangoli design for Holi. 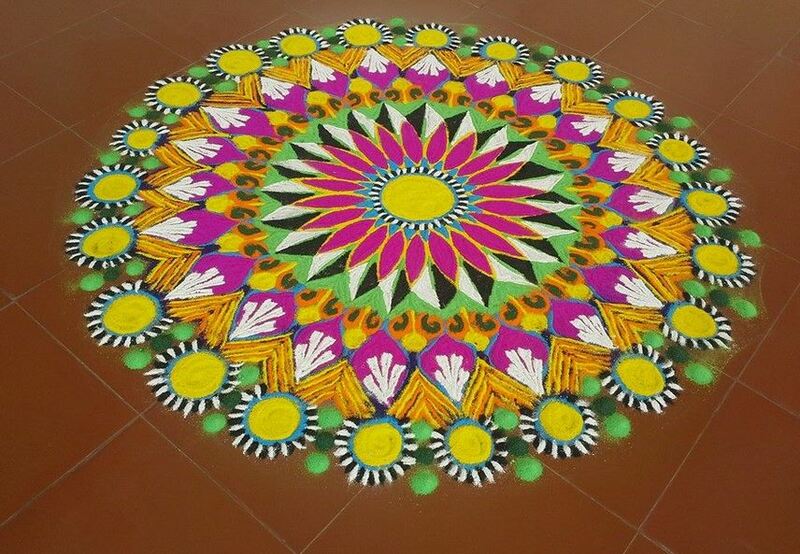 Go for some these fresh rangoli designs 2015. It has a square inside another and a circle in the centre. Add Om symbol in it. 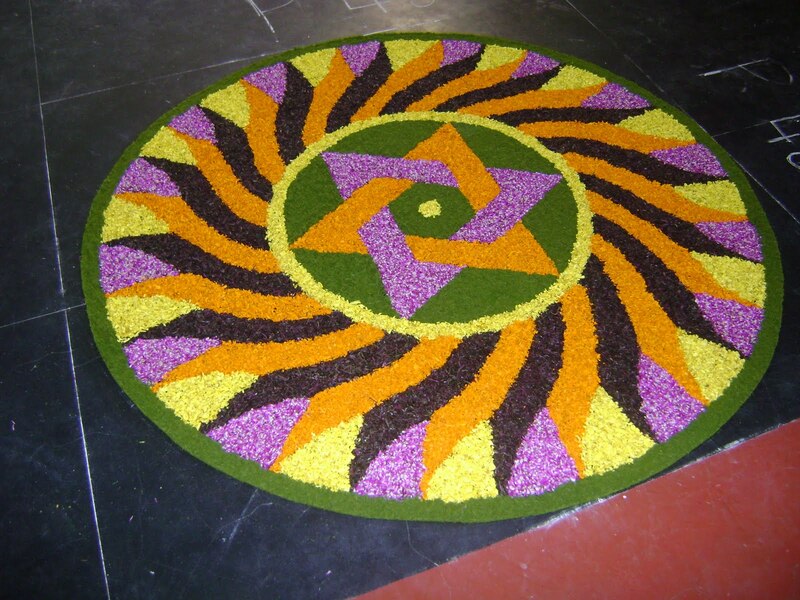 Use beautiful festive colors to make your rangoli design. 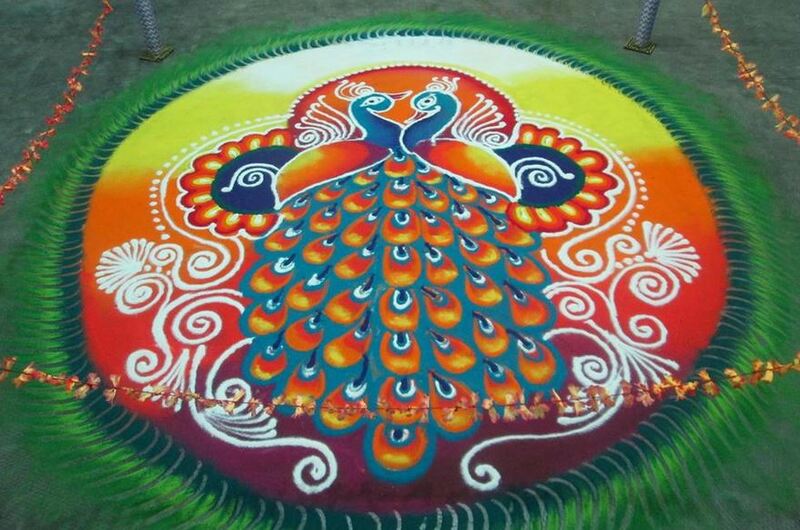 Here is a peacock rangoli design with a twist. A pretty white peacock with a hint of pink! It looks really magnificent. Use black for detailing. Try these rangoli designs for Holi competitions with themes. Go for this great colour combination — yellow, orange and brown. 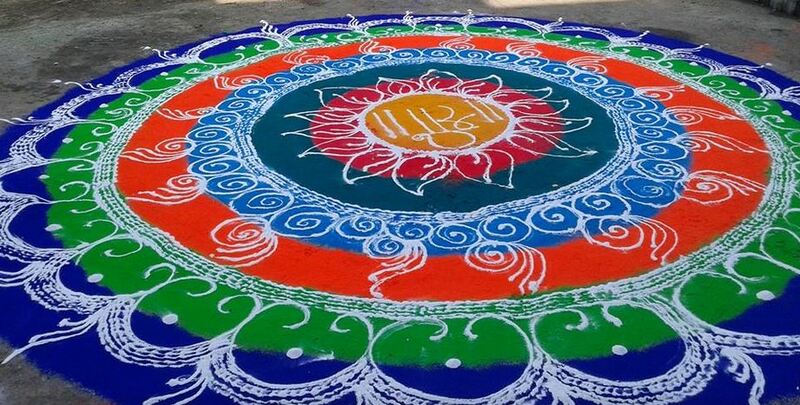 This rangoli design depicts Sun as the central star with millions other in blue sky. Make this beautiful rangoli design during festivals and on other special occasions. Place a kalash and coconut in the centre. 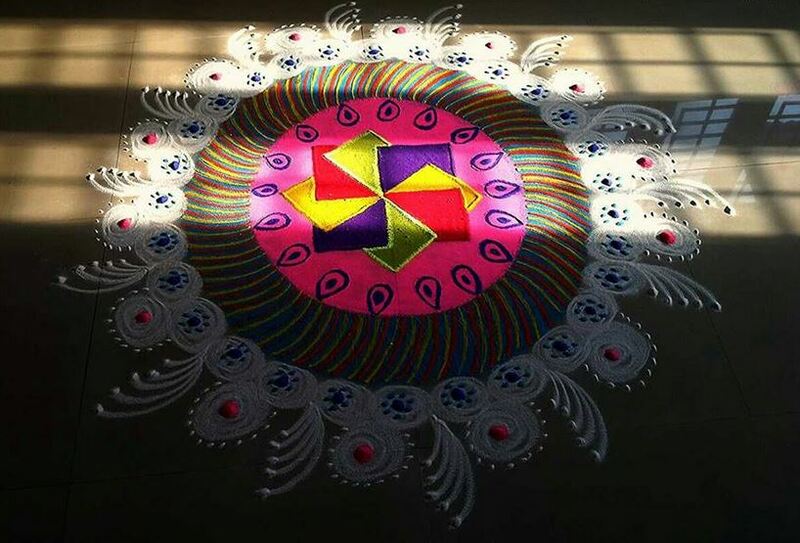 To create this 3D rangoli design. Use black, white, blue and green color to create the centre. Add a red circle on the outside. This huge rangoli is apt for competitions; make it in your society, college or school. 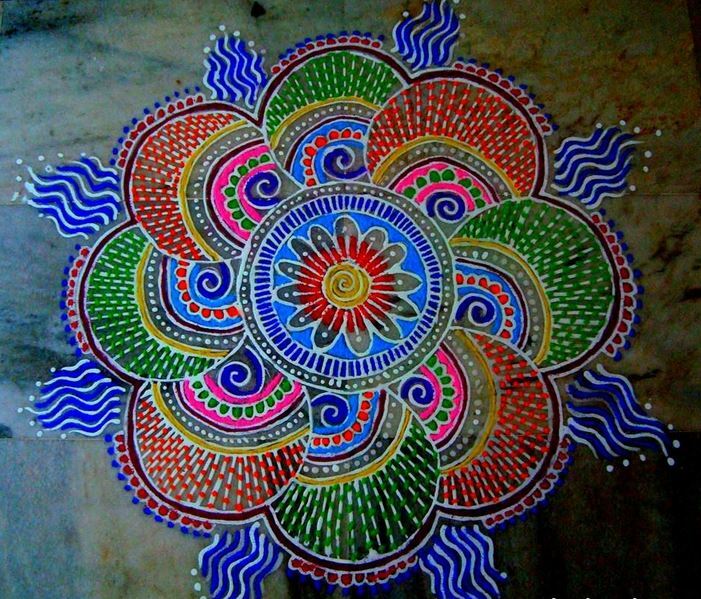 Here is another colorful kolam design. 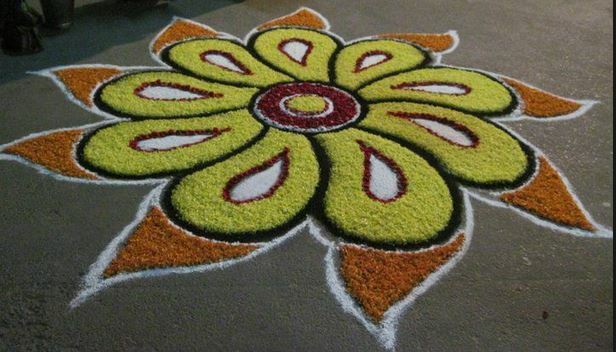 Make this vibrant kolam in front of your house. 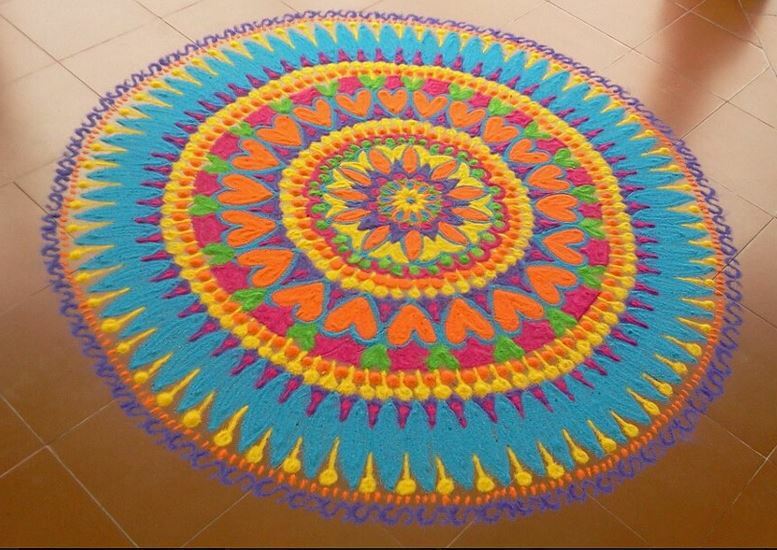 You can make this simple round rangoli using blue, green, orange, red, and yellow colours. 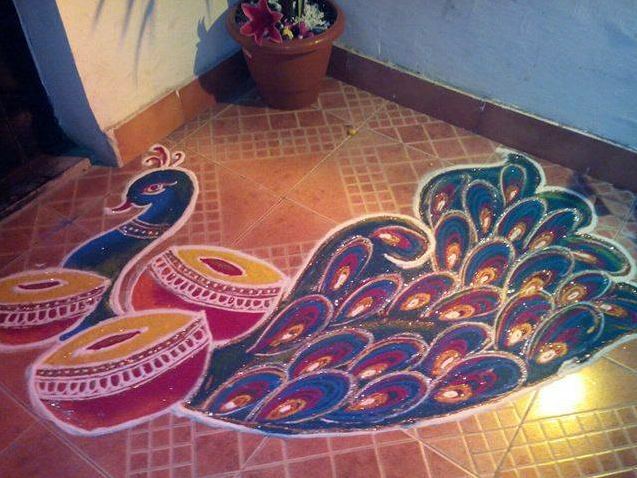 Make rangoli designs 2015 using rice flour to welcome deity into your house during festive season. 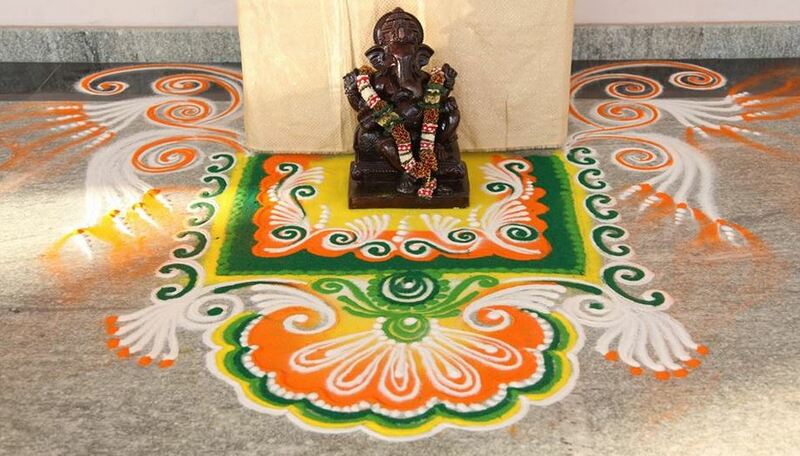 Lord Ganpati rangoli design is everyone’s favourite. Here is an amazing rangoli of lord Ganpati. Use yellow colour to create the base, draw your deity over it using red and blue. This is a very cute rangoli made using primary colours. 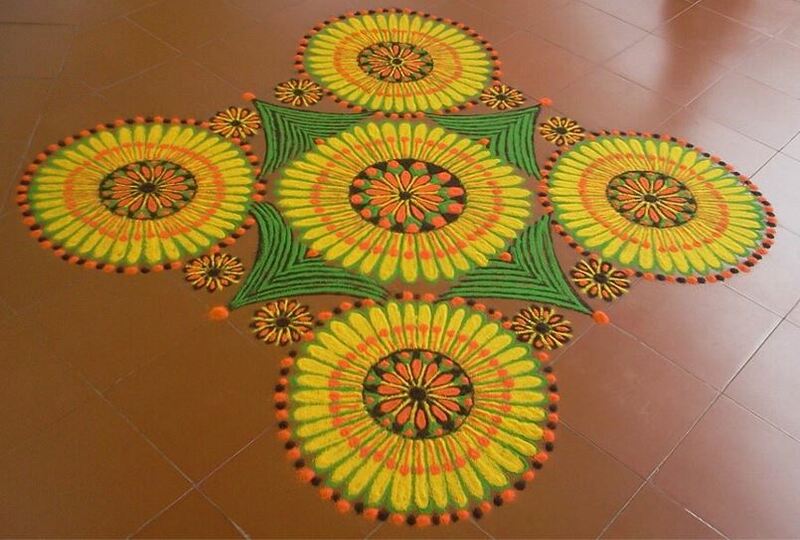 Use yellow, green, red and orange color to make this kolam rangoli design. Draw lots of floral patterns on it. 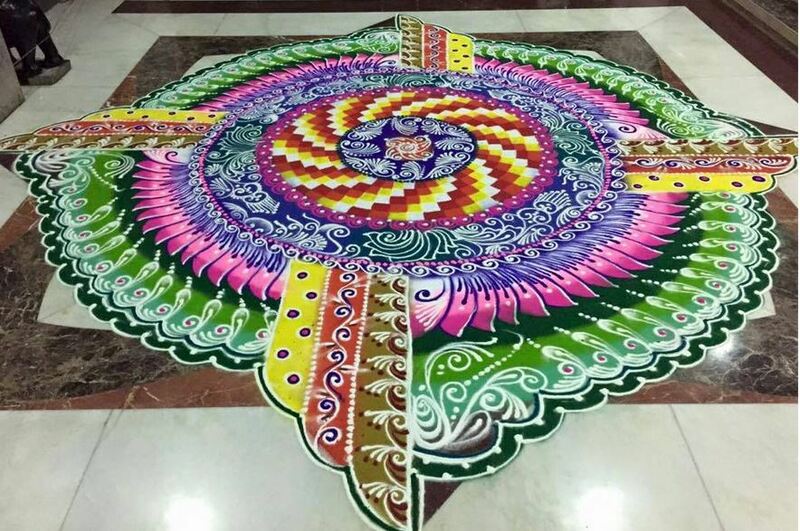 Make these mesmerizing free hand rangoli designs 2015 for Diwali. Place lord Ganpati in the centre and draw rangoli around it. 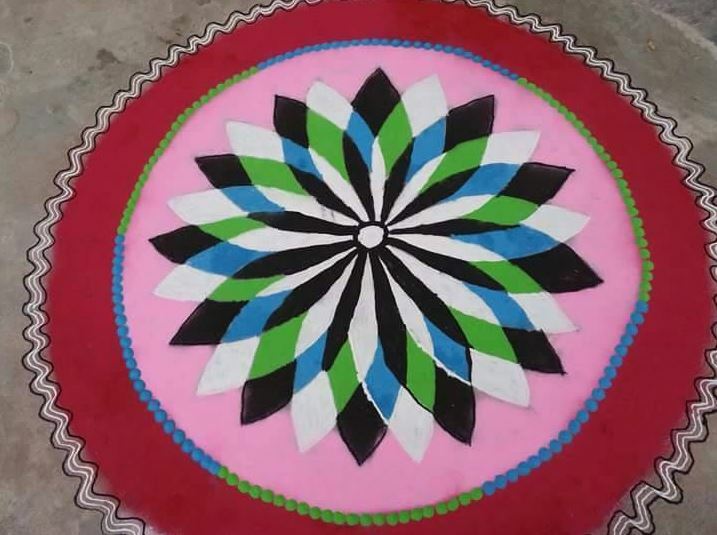 Make this cool, circular competition rangoli design. Use red for base to make it more attractive and appealing. 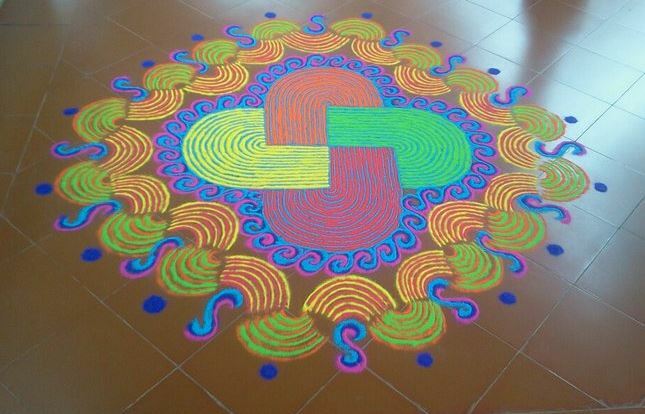 This is a cool free hand kolam rangoli design. 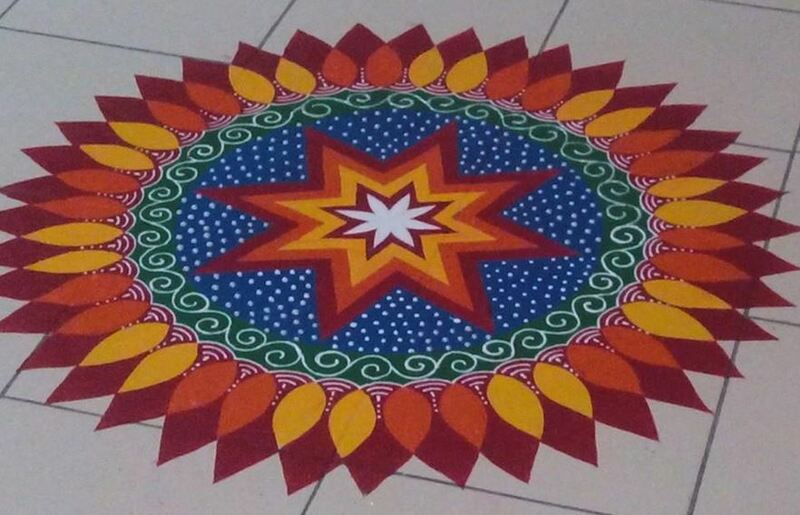 It’s a bright flower pattern rangoli; it is unique and extremely pretty. The flowers are drawn using yellow and orange color to which a bit of green and black has been added. This rangoli design was made on golden jubilee celebration of Dharampeth College, Nagpur. Dr Abdul Kalam was the honourable chief guest there. 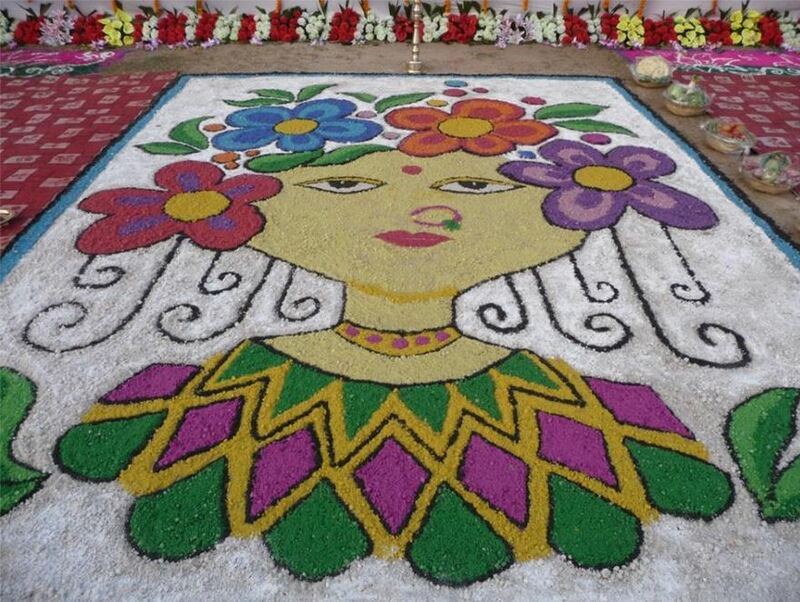 Create impeccable rangoli designs 2015, use rice flour and flower petals to make wonderful pookalam. Orange and yellow colour makes this design warm and welcoming. 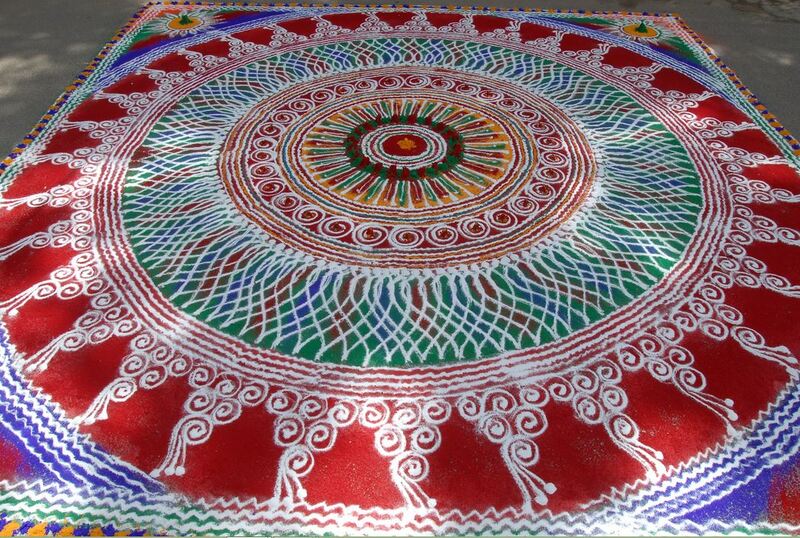 Make this vibrant piece of rangoli. Give it your personal touch by using your favourite colors and geometric patterns. This is a Shiv Ratri special rangoli design. 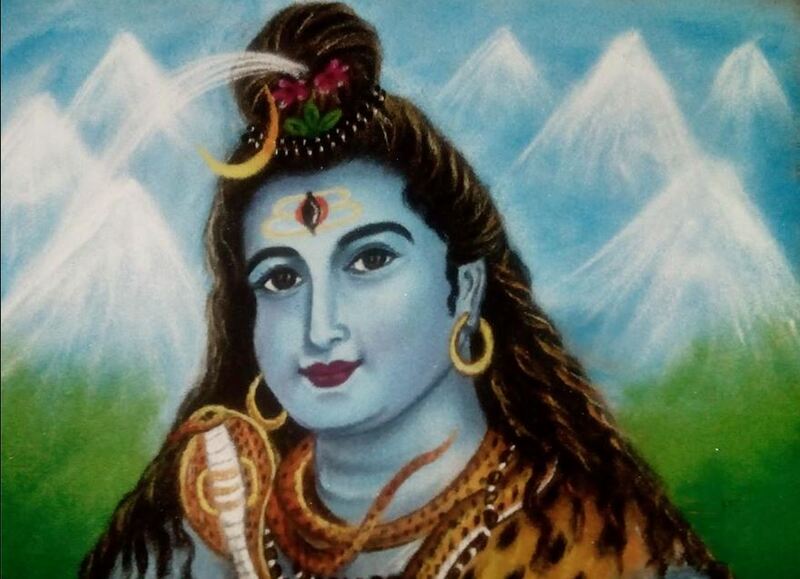 Make this mesmerizing rangoli of lord Shiva and you are sure to win the rangoli competition. 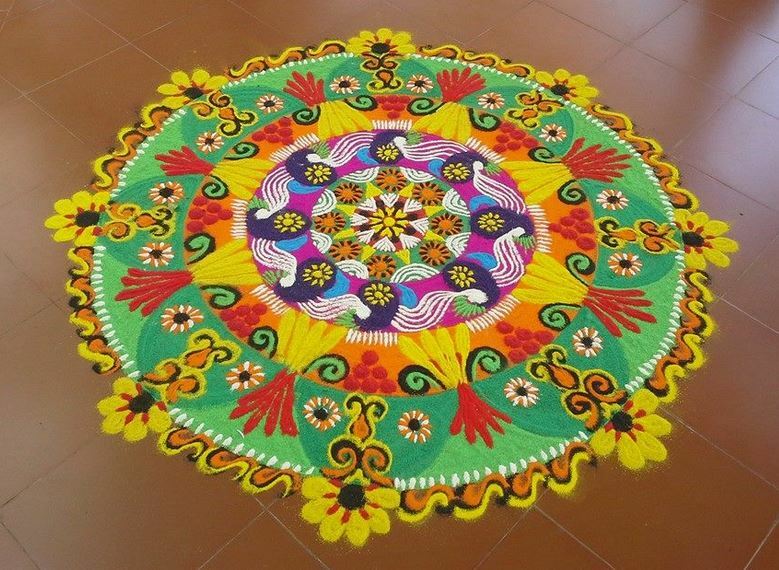 Grab everyone’s attention by making this amazing kolam rangoli in your home. Use four different colors to draw the curved lines in the centre. Make an interesting border with yellow, green, pink and blue. How about a modern 3D rangoli design? 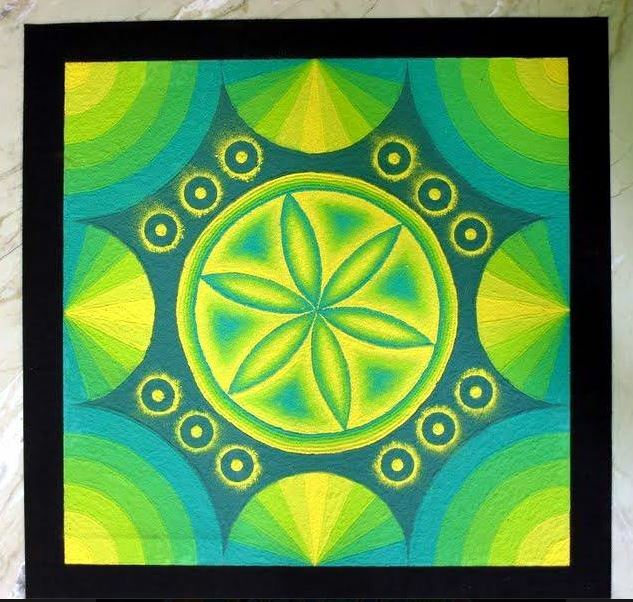 Use hues of yellow and green to make this geometrical pattern. Create a flower in the centre and add circles all around it. Durga means invincible, she is the most popular Hindu goddess. Make awesome rangoli designs for Dussehra. 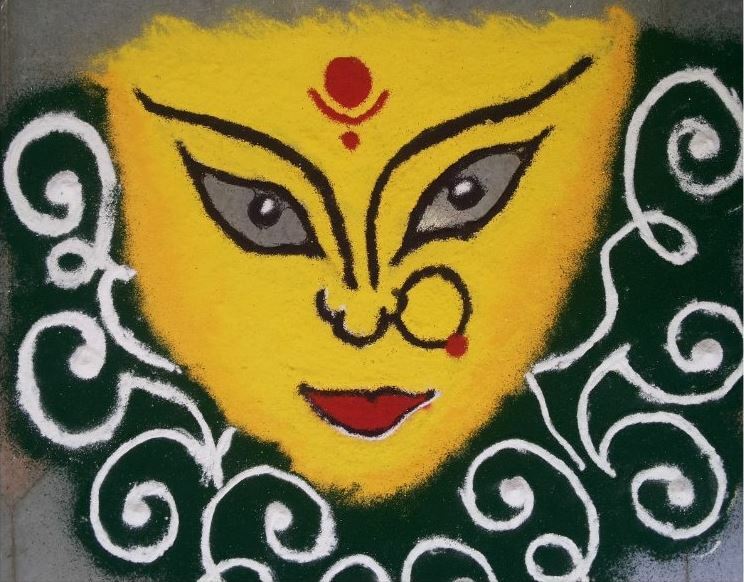 Here is an inspiring rangoli of maa Durga created using yellow color as the base. Draw her eyes, nose and lips using black. Use red to fill them up. 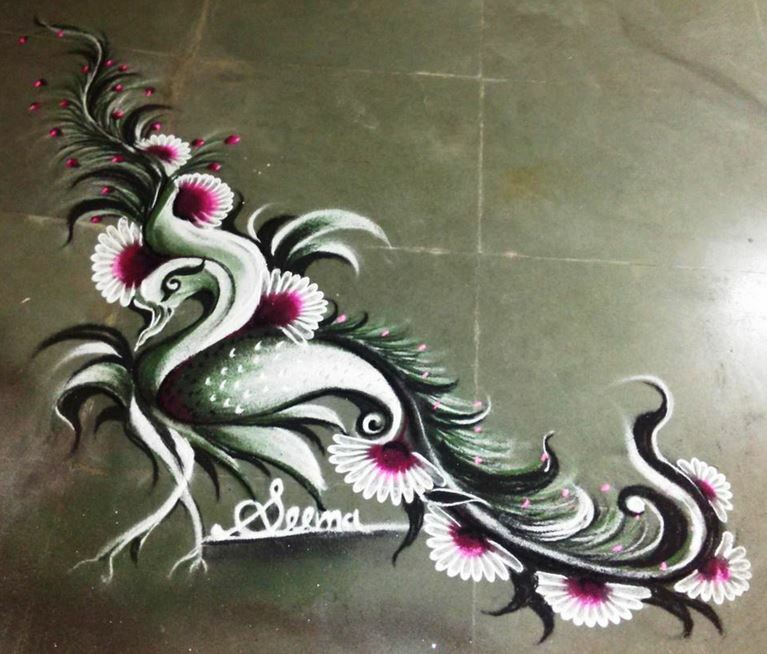 Here comes a peacock rangoli design, it’s my favourite among all. Create this magnificent bird and transform your home into a symbol of beauty and grace. 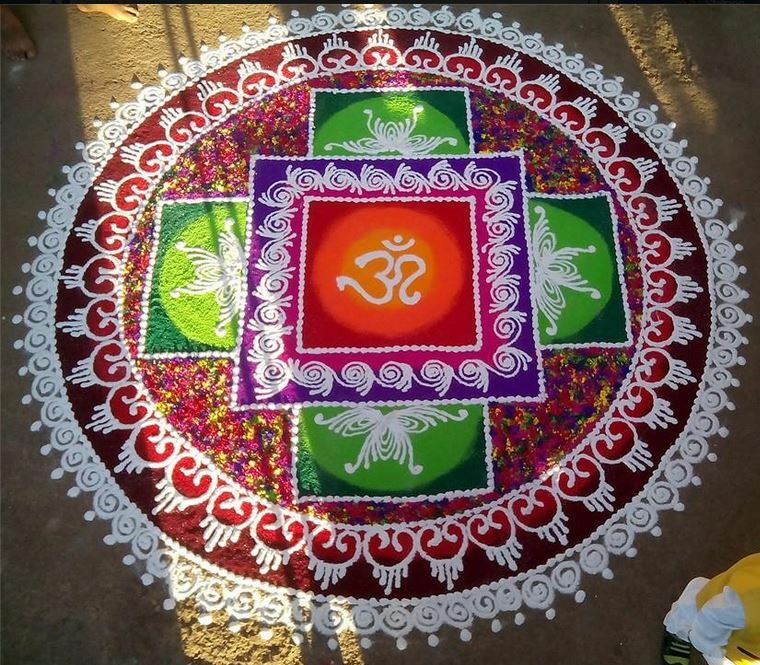 This rangoli design has an OM in the centre. Keep the background bright in color to make it stand out. Make circular patterns along the border with white. Choose this extremely colorful kolam rangoli design and make your Holi special. These intricate patterns are made with a lot of precision and neatness. 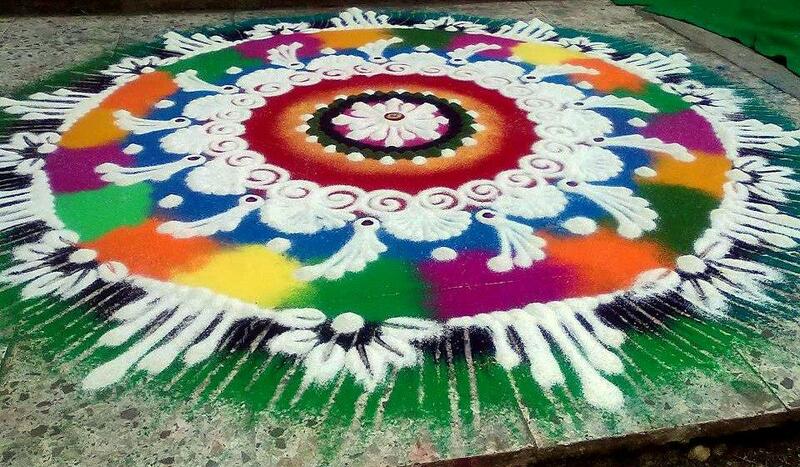 It can take you hours to create a perfect rangoli. If you don’t like lilies, then make Rose rangoli. Roses are considered the most charismatic of all the flower species found across the world. 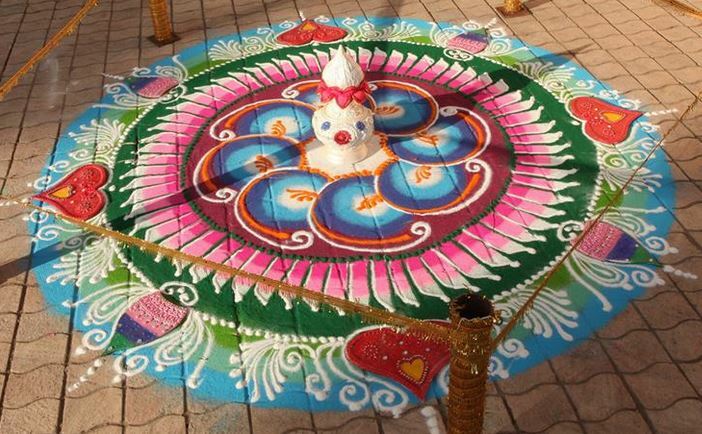 Peacock rangoli designs 2015 are very common in competitions. 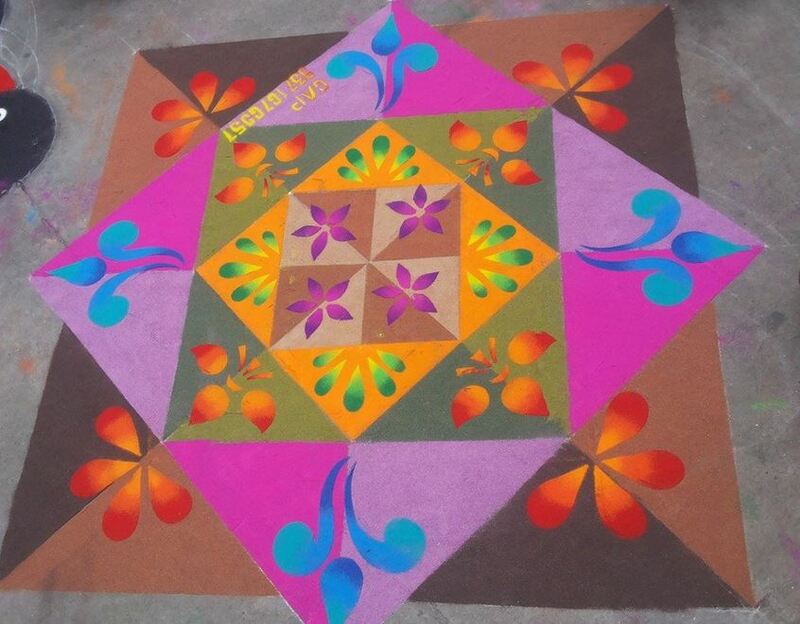 Make this mesmerizing rangoli design to win accolades from judges and audience alike. 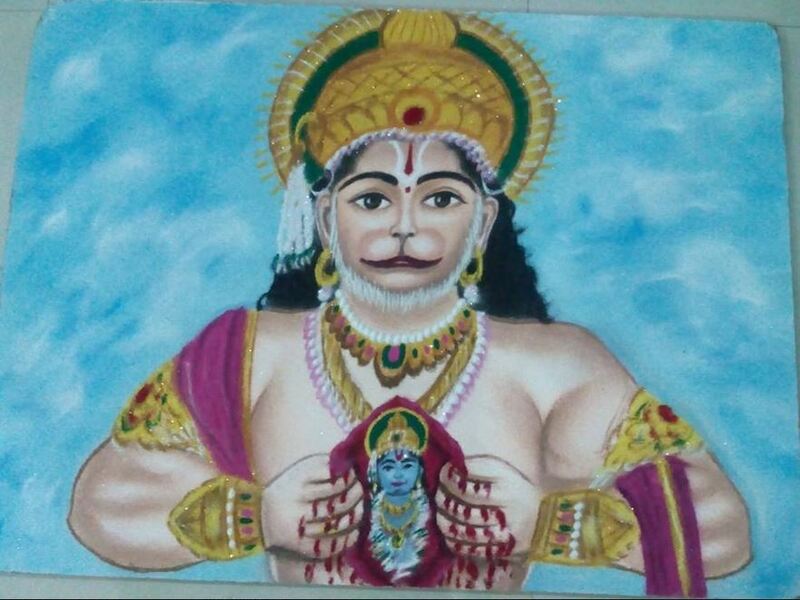 This entry was posted in Decor, Rangoli Designs and tagged 3D Rangoli Designs for 2015, Beautiful Rangoli Designs for 2015, Best Diwali Rangoli Designs, Best Free Hand Rangoli Designs, Best Rangoli Designs 2015, Best Rangoli Designs for 2015, Best Rangoli Designs for Competition, Best Rangoli Designs for Diwali, Best Rangoli Designs for Ganpati, Best Rangoli Designs for Gudi Padwa, Best Rangoli Designs for Holi, Best Rangoli Designs for Navratri, Best Rangoli Designs for New Year, Best Rangoli Designs for Ugadi, Colorful Rangoli Designs for 2015, Competition Rangoli Designs 2015, Competition Rangoli Designs for 2015, Easy Rangoli Designs for 2015, Festive Rangoli Designs for 2015, Kolam Rangoli Designs for 2015, Latest Rangoli Designs for 2015, Rangoli, Rangoli 2015, Rangoli Design, Rangoli Designs, Rangoli Designs 2015, Rangoli Designs 2015 for Competition, Rangoli Designs for 2015, Simple Rangoli Designs for 2015, Top Free Hand Rangoli Designs, Top Rangoli Designs, Top Rangoli Designs 2015, Top Rangoli Designs for 2015 by Homemakeover. Bookmark the permalink.